During the last half of season 4, AMC’s The Walking Dead took a different approach to telling the zombie story, breaking the core group up into smaller factions and following each one for an episode, or at least most of them. Season 5 has taken that strategy and added even more narrative tweaks and gymnastics. They’ve staggered the timeline, so not only do events in different places play out simultaneously, each chapter adds to your overall knowledge, filling in blank spots and answering questions posed earlier. Thus far, it’s been an inventive tactic, creating a tension that carries week to week, and builds the arc of the season in a different and unusually satisfying way. (It’s weirdly like watching Arrested Development, letting stories unfold over multiple episodes, in multiple timeframes.) This week’s episode, “Consumed,” follows this path and delivers one of the best installments of the season. While this episode truly belongs to Carol (Melissa McBride), it also serves to remind you that, even with all of the growth experienced by other characters, Daryl (Norman Reedus) is still the best person on this show, bar none. 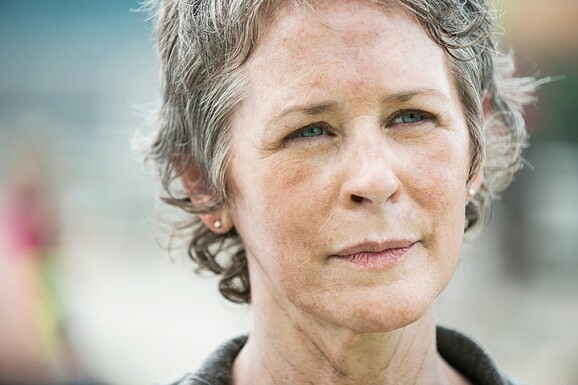 Though “Consumed” has a present arc, it traces Carol’s evolution, filling in the gaps in her story between when Rick (Andrew Lincoln) banished her until she joins up with Tyreese (Chad L. Coleman) and the young girls. These flashbacks crop up from time to time through the episode, shedding light on heretofore hidden pieces of Carol’s story, providing some depth and texture. When last we saw Carol and Daryl, they were in hot pursuit of a car with a white cross in the back window, like the one that took Beth (Emily Kinney). Having watched “Slabtown” a few weeks ago, we know what’s happening on her side of things, and that she’s still alive but being held in a hospital in Atlanta. This takes the investigative duo into the middle of a dead city, and while it hasn’t come up much, you realize just how long it’s been since The Walking Dead visited a major urban center. This is such a different landscape than you’re used to, sinister in a whole different way, like when a cacophony of walker voices begin to echo off of the concrete walls, building to an overwhelming roar. While following clues, they hunker down for a bit in a place from Carol’s past. What this spot was remains vague at first, but it turns out to be a battered women’s shelter. This harkens back to her previous life, illustrating how far she’s come, how much she’s changed and achieved, while also highlighting the huge cost she’s paid. As if to drive this point home, “Consumed” is intercut with images of smoke and flame, often in the distance, like when you witness Carol discover the ruins of the prison. Other times the fire is as close as you get, like when Daryl steals a cigarette from Noah (Tyler James Williams), who we know escaped from the hospital and knows all about Beth. Fire doesn’t get much closer than the end of a smoke, but it’s an emotional moment where Daryl burns the bodies of a woman and child walker they find at the shelter, that has the most impact. The metaphorical connection to Sophia, who is literally dead, and Carol, who is metaphorically dead, at least the person she was, is clear. For all of Carol’s talk of leaving, of not being able to save people anymore, and how everything is different, she’s still there, she’s still helping, she’s still fighting. Even after Noah jacks their weapons in their first meeting, where she tries to shoot him by the way, in their second encounter, she shows compassion that, you can tell, surprises even her. She may think she’s hard, calloused, and dead inside, she may tell herself that, and though she’s capable of terrible things, she’s not as different as she thinks, at least not in the important ways. With only two episodes of The Walking Dead left in 2014, before the show goes on its annual mid-season hiatus, the end of “Consumed,” which finds Daryl and Noah racing back to the church for reinforcements, sets up a coming clash between the main group and the folks at the hospital. This is The Walking Dead after all, and you expect a certain level of mayhem and violence to mark any significant milestone. As it stands, every half season keeps to it’s own arc, and what follows blazes a new trail. The way things are headed right now, when the show returns in 2015, things are going to look drastically different.